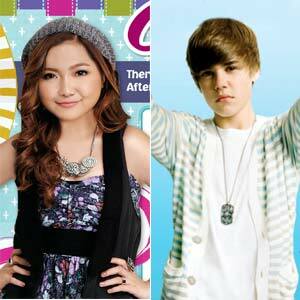 Charice will meet Canadian pop star Justin Bieber (right) when they both appear on the May 11 episode of Oprah. The Filipino singer will launch her self-titled album on Oprah Winfrey’s show. Who would have thought that after a losing stint in ABS-CBN’s singing competition Little Big Star, Charice Pempengco would go on to a thriving international singing career? For sure, she didn’t. "After losing in Little Big Star, I felt like my dreams were taken away. I was depressed for months," Charice shares with Total Girl magazine, where she appears as cover girl this May. She was able to bounce back though, and make her mark in the music industry, not only here in the Philippines but also abroad. Charice, who will turn 18 years old on May 10, will be launching her new album on the May 11 episode of Oprah. Set to guest on the same episode is Justin Bieber whom Charice is meeting for the first time. The Canadian pop star is behind the popular songs "One Time" and "Baby." "We at Warner Music Philippines are very excited for the release of Charice’s self-titled international debut album! And proud of her for being crowned as the newest Pop Princess by the New York Post," says Haze Romawac, International Strategic Marketing Executive of Warner Music Philippines. Charice tells Total Girl what fans can expect from the album: "Most of the songs have a pop and R&B sound to it, but of course, there are ballads in there, too. We tried to have songs there that anybody would be able to like, no matter how old they are." Even though she has worked with David Foster and big stars like Celine Dion, Josh Groban, and David Archuleta, Charice keeps both feet on the ground. "I don’t think anything really sets me apart from everyone else. I just work hard and do my best," she says simply. At such a young age, Charice knows that disappointments and failures are inevitable. That’s why she dishes out this advice for young girls who dare to dream big: "Find a way to keep on going. There will always be bigger and better things for you out there!" Total Girl is now available in bookstores, newsstands and supermarkets nationwide.